German cultural historian Burckhardt (1818—97) delivered a series of controversial lectures in the 1870s on life in ancient Greece, now first translated into English to provide a fascinating reexamination of Hellenic civilization. Burckhardt presents Greek society from the Heroic Age to the Hellenistic period through historical anecdotes drawn from texts by ancient philosophers, rhetoricians, historians, and comic writers. Vigorously opposed to the Greeks’ democratic political culture, Burckhardt portrays the polis as a stifling environment, where the individual was completely subordinated to the common cause. The state exercised tight control over all aspects of life, from religious festivals and athletic competitions to education, freedom of movement, and family life, even sanctioning the murder of malformed children. Burckhardt convincingly demonstrates how Greek democracy eventually degenerated into a tyranny of corrupt officials and sycophants that subjected citizens to constant surveillance and threatened them with excessive taxes, property confiscation, and execution. At the core of the Greek mentality was agon, or competition, and each man aspired to supercede others. Victory in athletic games opened the door to political influence and immortal glory. For the ancient Greeks, a harmonious individual excelled in a wide range of fields but never dedicated himself to a single profession. This accounts for the amazingly low social prestige of artists, especially sculptors, whose work required too much commitment. Burckhardt provides interesting insights into Greek pessimism, rooted both in their lack of belief in an afterlife and the oppressive political climate. This pessimistic worldview moved many Greeks to focus on wealth, fame, and physical pleasure. 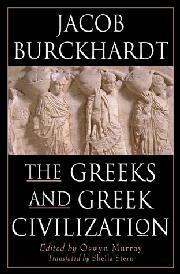 Burckhardt’s investigation concludes in contrast to the traditional idealization of Greece as the cradle of Western humanism: “the blissful golden age of fantasy has never existed.” An instructive excursion into Greek life, provided readers are not intimidated by occasional dense scholarly passages and a fair number of untranslated Greek words.